Select one of the images below for a larger view. Commission an original Pet Portrait by Lisa LaTourette. Choose your favorite Giclée from the gallery of images. Order a collection of Note Cards as a special gift. Give a Gift Certificate to someone you love. Commissioning an original painting of your beloved companion animal is an exciting and fulfilling indulgence. To learn more about the process of working with Pet Portrait Artist Lisa LaTourette, view both the FAQ and PRICES pages. If you don't see the size, budget or style that you were wishing, simply CONTACT Lisa to share your thoughts and talk about what is possible. And if you'd like to give a pet portrait to someone special, consider a gift certificate. This allows the lucky recipient to be a part of the process, which is fun. What is a Giclée and why would I want to order one? Giclée ( JEE-clay ) printmaking comprises a set of breakthrough digital, media and ink technologies for reproducing fine art. The image quality is so high, the color and detail, the look and feel of each reproduction are often seen to be identical to the artist's original, even by the artist! Accepted by museums, galleries and fine art collectors around the world, owning a giclée is the next best thing to owning the original. The giclées are printed on Epson Premier Art Waterproof canvas material and include UV protective coating. Prices quoted are stretched over appropriate frames or gallery wrapped. Please ask for a quotation if you'd prefer flat canvas or paper. Giclées are available on all my gallery images. 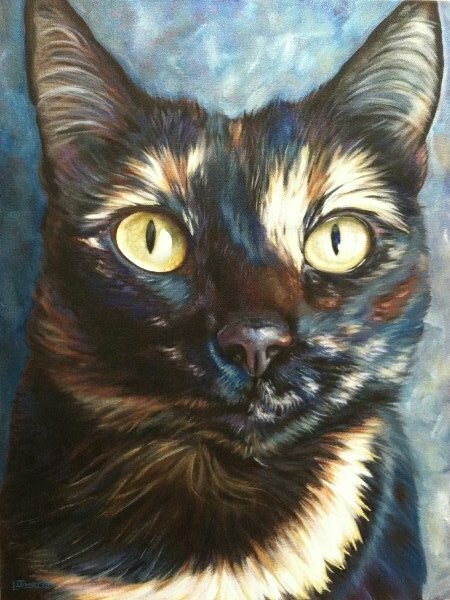 When you commission your custom pet portrait, consider having giclées made for other friends or family. You can select them at any time here on the gallery page. They make thoughtful and valued gifts. There can only be one original dog, cat or horse portrait. But you can order as many reproductions of your animal portrait as you'd like. As with the original commissioned paintings, every giclée is trademarked with my signature and Swarovski crystal. Even if you have not commissioned a custom dog, cat or animal portrait, you can order any giclée from this gallery of images. Many people have remarked that their pet looks "just like that painting" on my website. For a fraction of the cost of an original, you can own the next best thing with a giclée. Gallery images are also available on Note Cards. Beautiful reproductions of the gallery oil paintings are available on note cards. Choose from sets of 10 or 25 in a collection with matching envelopes. Perfect gifts for friends and family. Visit PRICES for more details.